I've been using this face mask for a long time! Very moisturising for the skin, smells good enough to be eaten. It has mild exfoliation properties. 1 tsp of roughly grinded rice powder - You can grind your own rice or purchase rice mask, e.g. 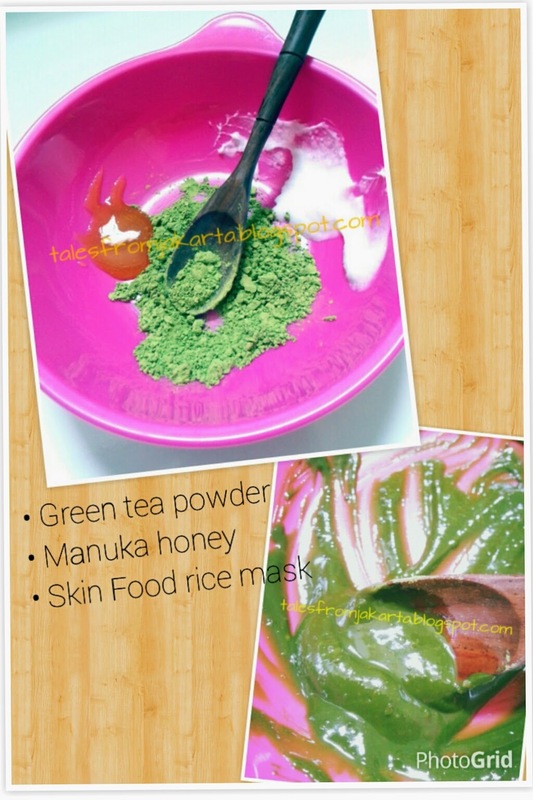 Skin Food Rice Mask. 1/2 tsp of green tea powder - tea leaves are not a good idea because it doesn't stick well to the face. 1 tsp of raw honey - I'm using Manuka honey. Some pre-boiled and cooled water if you're using rice powder. Skip the water if you're using Skin Food Rice Mask. Mix the rice powder, green tea and honey in a clean bowl. Add water bit by bit to dilute the mask into a semi-thick consistency. It shouldn't be too runny. Apply to face and décolleté. After leaving it on for 15 minutes, wet your fingers and gently massage your face in circular movements for 1 minute. Rinse off thereafter. Preferably, use twice a weekly.